Hey guys! It’s been a while and I’ve been playing a bunch of games. One I’m still playing is Animal Crossing New Leaf for the Nintendo 3DS. I have unlocked the coffee shop and got it built and have gone through enough of it to open up the option of me working there. This is pretty fun actually! 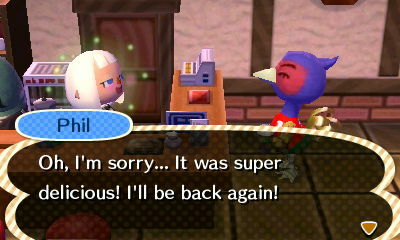 You get a cute little outfit and get to make coffee for your villagers and others! 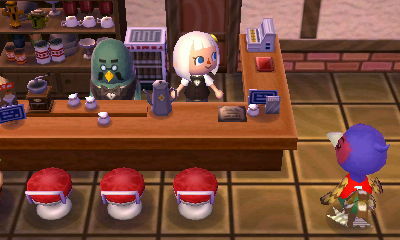 Each villager has a specific coffee request, however they only tell you a little bit of their order and it’s up to you to get the rest of it right. Sounds a tad scary heh? Never fear! There is a great wiki that tells you all of the villagers favorite cup of coffee! You can find that page here. After you get about 3 villagers you will get an NPC from the town. The wiki page doesn’t have those individuals listed, however below is a list of what each NPC would like in their coffee. If you make all of your coffee customers happy Brewmaster will give you the best beans he can (worth the most bells) and sometimes he will give you a gift of furnitureI I hope this quick chart helps you satisfy your NPCs in Animal Crossing!